Quincy Jones was convinced at an early age to explore music by his teenage friend Ray Charles. He played in various bands through the 50’s, began composing for film and television in the mid 60’s and eventually produced over 50 scores. He has worked with musicians Michael Jackson, Frank Sinatra, Aretha Franklin and Celine Dion. He’s also the most Grammy-nominated artist in history, with 79 nominations and 27 wins. Jones founded a charity for youth in 1985. 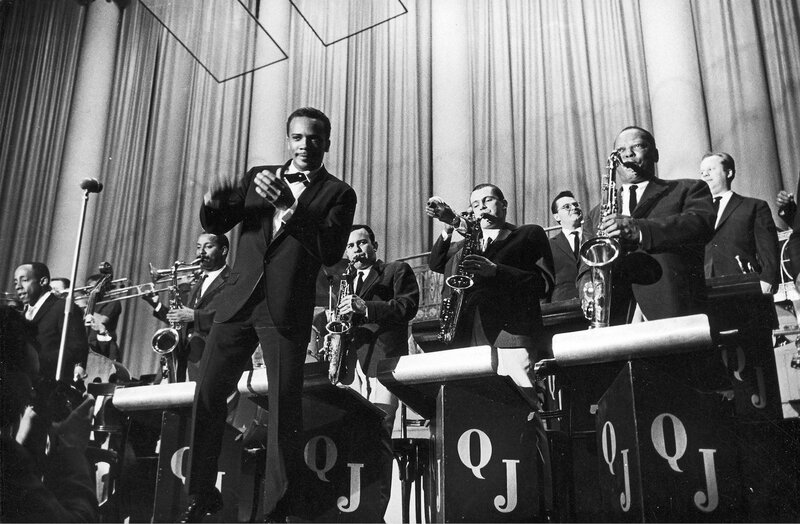 Famed musician Quincy Jones was born Quincy Delight Jr. on March 14, 1933, in Chicago, Illinois. A multifaceted jazz and pop figure who became the most Grammy-nominated artist in history with 79 nominations and 27 wins, he began with his Seattle teenage friend Ray Charles, who interested him in arranging. He played trumpet and arranged for Lionel Hampton (1951-3), then worked as a freelance arranger on many jazz sessions. He served as musical director for Dizzy Gillespie’s overseas big-band tour (1956), worked for Barclay Records in Paris (1957-8), and led an all-star big band for the European production of Harold Arlen’s blues opera, “Free and Easy” (1959). Returning to New York, Jones composed and arranged for Count Basie, Dinah Washington and Sarah Vaughan, while holding an executive post at Mercury Records and producing his own increasingly pop-oriented records. In the mid-1960s he began composing for films and television, eventually producing over 50 scores and serving as a trailblazing African-American musician in the Hollywood arena.Jones produced Aretha Franklin’s 1973 album Hey Now Hey (The Other Side of the Sky). In 1975, Jones founded Qwest Productions, for which he arranged and produced hugely successful albums by Frank Sinatra and other major pop figures. In 1978, he produced the soundtrack for the musical adaptation of The Wizard of Oz, The Wiz, starring Michael Jackson and Diana Ross. In 1982, Jones’s produced Michael Jackson’s all-time best-selling album Thriller. In 1985, Quincy Jones used his clout among major American recording artists to record the much celebrated anthem “We Are the World” to raise money for victims of famine in Ethiopia. His work on behalf of social causes has spanned his career, including the Quincy Jones Listen Up Foundation, which built more than 100 homes in South Africa in 2001. The charity aims to connect youths with technology, education, culture and music and sponsors an intercultural exchange between teens in Los Angeles and South Africa. Jones produced the 1985 film The Color Purple, directed by Steven Spielberg and starring Whoopi Goldberg, Oprah Winfrey and Danny Glover, as well as the television series The Fresh Prince of Bel-Air (1990-96), starring Will Smith. He also published the magazines Vibeand SPIN, and in 1990 he formed Quincy Jones Entertainment (QJE), a co-venture with Time Warner, Inc. Q: The Autobiography of Quincy Jones was published in 2001. In a GQ interview published in early 2018, the music icon said he liked contemporary artists like Bruno Mars, Drake and Kendrick Lamar, but admitted he was no fan of Taylor Swift’s music, saying, “We need more songs, man. F—ing songs, not hooks.” He raised more eyebrows with comments from another interview published in Vulture around the same time, alleging that Michael Jackson “stole a lot of songs” and that Marlon Brando and Richard Pryor had slept together.